The Brazilian Moruga Red is an AWESOME pepper folks! Scorching heat paired with an amazing flavor makes this variety one on the "Must Grow List"!! :) There will be 20+ seeds per pack! 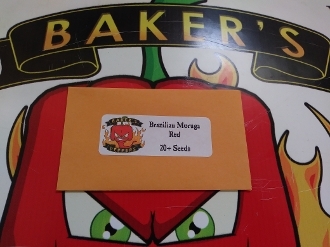 With a Scoville Heat rating in the 2.1 million range, this variety will scratch that "I need some HEAT" itch for sure!!! :) This variety will mature from green to a nice bright red color. It grows from seed to harvest in approx 155 days! Order yours TODAY! !